The boy emerged from an Italian neighborhood in a Philadelphia world that still smelled like burning coal, burning wood and big pots of gravy (that's right: "gravy") bubbling on the stoves. From a world in which the milkman made his slow zig-zag way through the city's streets, an old horse pulling, then waiting; pulling, then waiting, old head dropped low, as his master set the bottles on one side, then another. And when the last clip-clop faded into the distance, the boy would sneak through the grey light of dawn, from stoop to stoop, drinking the cream off of the tops of people's bottles. Wide-eyed, he'd watched as Dorothy's world went from sepia tones to glorious color, on the screen, for the first time, along with the other children of his generation, as her door opened onto Oz. He ran home on summer nights, dashing especially quickly past dark alleyways, after having spent all afternoon ("for ten cents," he would tell me) with a bag of his grandmother's sandwiches while watching Frankenstein and Dracula creep and stomp through the flickering, silver screen shadows. He sat on the floor in his father's business, "Joe's Market", on 19th and McKean, playing Mario Lanza on a record player, annoying everyone by lifting and dropping the needle in the same place, over and over and over, just to hear one of Puccini's musical swells...just to nourish his little heart that needed harmonic direction the way a plant needs light. He heard what Hitler was up to; saw newsreels before movies; laughed at the silly little moustache, but was too young to really understand, so he sat on a stone lion and posed with a comb over his upper lip: the Great Little Dictator. 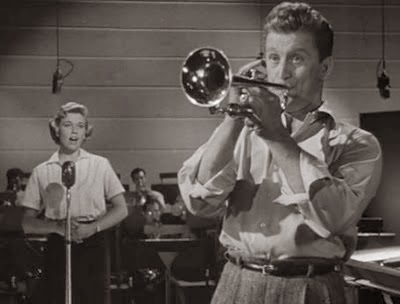 He saw Kirk Douglas in Young Man With a Horn, and knew what he wanted to do and who he wanted to be, so his grandmother bought him a silver trumpet and he played, first, like Harry James, but, soon, like Joe Matt. But that wasn't enough, so he walked (as he told it to his less than musically studious son) uphill, both ways, barefoot over broken glass to sit sat at the piano at his aunt's house and to discover chords and the soul-spinning effects of harmony, and he wrote and orchestrated, and approximated the power of God's voice for years to come. The Beatles and the Stones rushed past him like the cacophony of traffic in the distance as he rubbed elbows with the likes of Samuel Barber and the Curtis Institute crowd and as he explored the neo-Romantic, semi-impressionistic, sometimes discordant festival that was American orchestral music from the thirties through the seventies...but, he did look up and listen when Brian Wilson appeared outside of the fold he really should have found andhe did delight in the melodies of Richard Rogers. And the big bands still called to him. Not jazz. Jazz was a mess. Joe Matt knew the sound before it was heard; he wrote it down and, as long as they played it as written, magic happened. One day, he tried to avoid meeting a singer that a friend had recommended, but fate would have none of it. She showed up at the door, though he'd thought the meeting had been successfully canceled. It's because of that snafu that I exist at all. And it is because of that mix up that he chose the warmth of family over the applause of strangers. I say "chose" because he had all of the talent he needed; he had the musical vision of his famous contemporaries. Still, he made his choices and those choices led him into a lifetime of love and laughter; a lifetime that buzzed, if truth be told, in the background of his mind, with occasional little bites and itches from mosquitoes of regret. This, of course, doesn't mean the angel Gabriel isn't sweating a little, now that Joe Matt is in town -- and now that he is, once again, the young man with a horn.